Agility is fun for everybody! 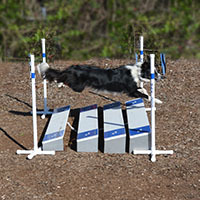 Dogs and humans of all shapes, sizes, and ages can enjoy agility. The fun part for the dogs is getting to spend time with you! From beginners to advanced competitors, the goal is the same – working towards better communication with your dog and having tons of fun. 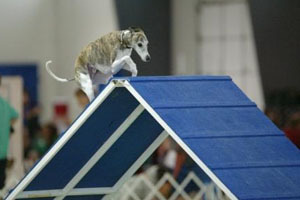 The sport of dog agility began in London, England, in February 1978. John Varley, a member of the committee for the Cruft’s Dog Show, asked a friend to come up with a set of obstacles similar to those for horse show-jumping as a fun event for the dog show. 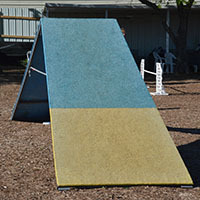 It has since spread throughout the world as a fun sport for dogs and handlers to share. There are 10 basic obstacles in agility, pictured and described below. Have more questions? Check out the FAQ page! 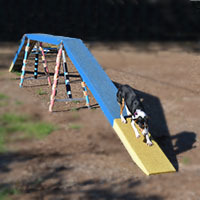 A set of four or five slightly raised platforms that form a broad area over which the dog must jump without setting their feet on any of the platforms. 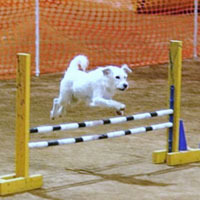 The length of the jump is adjusted for the dog’s height. 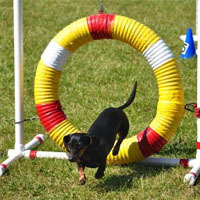 The dog must jump through the opening of the “tire”; like other jumps, the height is adjusted for dogs of different sizes. Most organizations now require a breakaway tire to prevent injury if the dog hits it while jumping. A bridge-like obstacle consisting of two inclined planks (ramps) on either side of a raised horizontal plank. The center plank is about 4 feet (1.2 m) above the ground. This obstacle has two “contact zones” on each side of the inclined ramps, marked in a distinct color. The dog must put at least one paw in the contact zone (“down contact”) before departing the obstacle. Two broad ramps hinged together and raised so that the hinged connection is between 5 and 6 1/4 feet above the ground, roughly forming an A shape. The bottom 36 to 42 inches form the “contact zones”, marked in a distinct color. The dog must place at least one paw in the “down contact” zone before departing the obstacle. 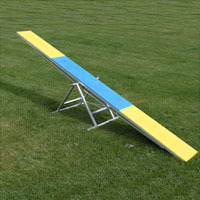 A 10-to-12-foot plank pivoting on a fulcrum, much like a child’s seesaw. It is constructed slightly off balance so that the same end always returns to the ground. This is done either by placing the support slightly off center or else weighting one end of the board. This obstacle also has “contact zones”. 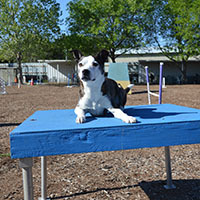 At least one paw must touch each contact zone while performing the teeter. A vinyl tube, 10 to 20 feet long and about 2 feet in diameter, through which the dog runs. 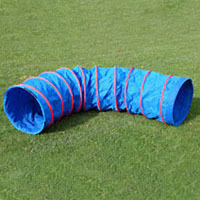 The tunnel is constructed of flexible vinyl and wire, such that it can be configured in a straight line or in a variety of curves. Sandbags are used to keep the tunnel in place. An elevated square platform about 3 ft x 3 ft. The height is adjusted for the height of the dog. The dog must jump onto the table and wait (pause) there while the judge does a 5 second count. For some organizations, the dog may be in any position during the count (sit, stand, down); other organizations require a down on the table. A series of 5 to 12 upright poles, each about 3 ft tall and spaced about 24 inches apart, through which the dog weaves. The dog must always enter with the first pole to his left, and must not skip poles. 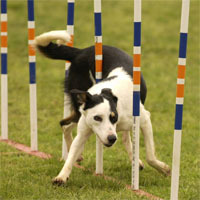 For many dogs, weave poles are one of the most difficult obstacles to master.